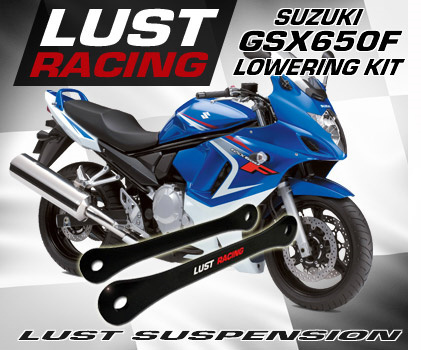 Suzuki GSX650F Lowering kit by Lust Racing fits year models 2008 onwards. High quality steel lowering kit for your Suzuki GSX 650F. Lowering the rear suspension will increase high speed stability and increase rear wheel traction. Vertically challenged find the lowered seat height confidence inspiring and more comfortable as tip-toeing can be avoided when stationary.